London---Amid fear of backlash, Muslim communities have condemned the London blast that took the life of at least 50 people and injured more than 700 others. Police scrambled through precarious rail tunnels deep underground on Friday to hunt for clues and retrieve bodies. The attacks, which officials said bore the hallmarks of the Islamic militant Al-Qaeda network, were London's deadliest in peacetime and coincided with a G8 summit in Gleneagles, Scotland. The Muslim Council of Britain, which represents 1.6 million Muslims, received more than 1,000 e-mails containing threats and messages of hate. “Late yesterday morning at the offices of the Muslim Council of Britain we started to receive what was to be the first in a stream of several thousand e-mails each bearing the same message, in semi-literate English: "It's now WAR on Muslims throughout Britain," said Iqbal Sacranie, Secretary General of the Council. He added that terrorism has no religion and that everybody should unite in helping the police to capture these killers. “We share a common determination that terror cannot be allowed to succeed. It is now the duty of all of us as Britons to be vigilant and actively support efforts to bring those responsible for yesterday's terrible crimes to justice,” he emphasized. The Muslim Safety Forum, made up of national and regional Islamic organizations, issued a release denouncing such barbaric acts. “The MSF would like to express its total condemnation of such terrible acts and gross violations of the law of humanity. We would also like to re-iterate that the true message of Islam is one of Peace, Justice and the love of humanity. Islam holds the sanctity of human life in the highest possible regard and shedding the blood of an innocent person is seen as a most heinous and repulsive crime,” said the Muslim Forum. In turn, the Muslim Association of Britain also denounced the attacks. Its president, Ahmed Sheikh, said the attacks would make the Muslim community less safe. He said women in headscarves might be in particular danger and warned all Muslims to be especially vigilant. Muslim News editor Ahmed Versi noted that one of London's biggest Muslim areas, around Aldgate, had been targeted. British of Moroccan decent, Abdelghafour Dahbi Skali, board member of the Muslim Cultural Heritage centre told Morocco Times that London attacks will certainly have adverse effect on Arab and Muslim communities in the UK, and particularly in London. According to Dahbi Skali, the police called for a meeting with community organizations, faith leaders, the business community, the Royal Borough of Kensington and Chelsea Council and other statutory and voluntary organizations. The meeting has resulted in sending a 24/7 patrols around religious centres and permanent 24/7 static police guards in front of Mosques and Synagogues. It was also decided that community leaders should report any incident to the police so it can be recorded and investigated. At another meeting Thursday evening, the directors of all the Islamic Centres in London decided to unify the Friday Speech, expressing sympathy with the victims, their relatives and friends. On Friday, the sermon (Khutba) was dedicated to condemning the attacks and to a call for peace and harmony throughout Britain and the world. Imams advised Muslims, particularly in London, to stand by to volunteer in assisting the recovery and emergency services if called upon, and for the possible need for a blood donating campaign. Imams also guided the Muslim Community on what they should do and not do, at home, in the street, while shopping and when traveling. Fears of more attacks kept commuters and markets jittery. "We have to have a maximum consideration of the risk of another attack and that's why our total effort today is focused on identifying the perpetrators and bringing them to justice," British Home Secretary Charles Clarke told BBC radio. Investigators searching for clues in the attacks said Thursday that the three bombs used in the subway apparently were detonated by timers, not suicide bombers as in the US 9/11 or cell phones in Madrid March 11, and that a fourth device may have been intended for a target other than the city bus that it destroyed. The bombs on the trains were believed to be package bombs left by the attackers who fled before they went off. 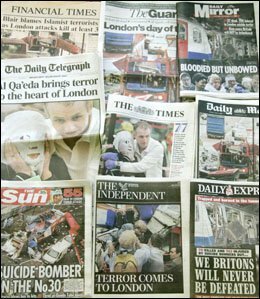 The bombings in Madrid and London were separated by 16 months. Like Madrid, the attacks on London were aimed not at symbols of power like Big Ben or Westminster Abbey but at the mundane: ordinary workers making their way to work in rush hours. In Madrid, 191 people were killed by the 10 bombs that ripped through four commuter trains during the morning rush hour. The effect in both cities was to paralyze the ordinary workings of the city. British authorities announced that every inch of every subway train in London would be examined to insure that no more explosives had been planted, just as the Spanish authorities examined every commuter train. As Madrid, politics may have played a role in the timing. But there were no elections in London. Instead, there was the first day of the G8 talks, led by Tony Blair at Gleneagles, near Edinburgh. The bombings in Madrid came three days before a close national election. Both Spain and Britain sent troops to aid the American-led war in Iraq and the military attack in Afghanistan, although it is not known whether support for American foreign policies played a role in the London attack. Thursday's scenes of shocked and bloodied commuters were in stark contrast to the jubilant crowds who took to the streets on Wednesday after London was awarded the 2012 Olympic Games. The London attacks have been claimed by an organisation that calls itself the Secret Organisation Group of al-Qaeda of Jihad Organisation in Europe, said the BBC. The BBC added that it has located an Islamist website that published a 200-word statement claiming the attacks, but declared that the group had not previously been heard of. The website had earlier carried statements purporting to be from al-Qaeda. But the BBC said that it was not possible to verify such claims published on the web. By Thursday night, there were far more questions than answers confronting Scotland Yard. One official said none of the scores of suspected terrorists being watched closely in England appeared to be involved. I can't believe I was in the tube when one of the bombs exploded. It was horrible. It was one of the worst days of my life. On my way to the bank in which I work in central London, I learnt there was another explosion close to the area. The bank was much safer than the street. I was scared. I left after a while to go home, but I was blocked as there was no means of transport. I spent around nine hours searching for a way to get back home. I eventually took a ferry to cross the River Thames to reach Waterloo, and here my suffering started. I took a train to a place outside London, and then tried to take another train to go back to town, but it was suspended. Thank God, some policemen helped and I came back in one of the police mini-buses. Once I reached North London, I had to take three buses, and then had to walk for two hours. I wasn't too unlucky as so many people in London, because most of them spent their nights outside their homes. I couldn't go to work today, and spent my whole day watching TV. I heard incidents of Muslims who already faced backlash. I hope I will never live to see what I have endured today. I am still under shock. It was a horrible day for London. When I left for the office in the morning, I didn't know what had happened but there was no underground service from any station. Imagine when there is no tube running in London, how much worse it is going to be. It took me four hours to reach the office, which is only 50 minutes away from my home. Then all the offices were evacuated by 2:00 on health & safety grounds and Londoners returned home at midday. As an Anglo-Moroccan, I fear the reprisals on my community (Central London alone houses over 12,000 Moroccans, let alone other Moslems). The police and community leaders in Notting Hill are trying to calm anticipated rising tempers. We have always enjoyed a harmonious relationship and co-existed with the host community in the Notting Hill area of London. Let's hope that Thursday's carnage will not affect it but will give people the determination to beat murder, carnage and barbaric acts anywhere in the world. Driving across London on Thursday was an experience I would not want to go through again. There were hundreds of people everywhere. People looked frightened and disoriented and just wanting to get away from nearby Underground stations. What has happened on Thursday is the work of barbarians and cowards who have no place at all in any country or faith. Innocent people were targeted while they were going to their businesses, universities, hospitals and schools. It has affected all faiths and all nationalities, young and old and all genders. This kind of tragedy will not help redress any lost causes or deprivation; on the contrary it will reinforce hatred and ignorance among people. Many peaceful countries experienced the horror and suffering that London suffered today. Together these countries are standing firm to condemn the London bombings and express their sympathy with all the victims, their families and friends. London was plunged into a serious transport chaos on Thursday with underground trains stranded in tunnels and all buses pulled from the streets for bomb checks following deadly blasts. The gridlock quickly stretched beyond London. Trains from across Britain were prevented from entering closed stations in the capital, where ambulance teams helped the injured including, scores of travellers stranded underground.